How to create an ISO Image file from DVD, CD, DVD, HD-DVD or Blu-ray disc. In some cases, you want to take backups of your optical disks in your local drive in order to access and use them as accessing and using your physical CD/DVD drive. In this tutorial you can find simple instructions on how to store your DVD, CD, DVD, HD-DVD or Blu-ray contents to an ISO image archive for backup, easy access or other reasons. For this task I prefer to use a lightweight and easy to use application, named “ImgBurn”. 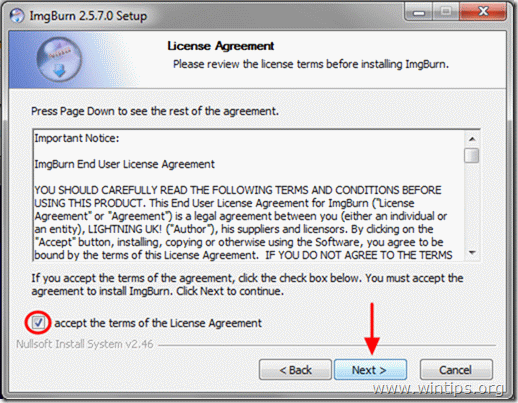 ImgBurn supports all Microsoft Windows operating system versions from Windows 95 to Windows 8. (98, ME, XP, VISTA, 7, 8, NT4, 2000, XP, 2003, 2008). How to save DVD or CD disc contents in a ISO image file using ImgBurn. Step 1: Download and install “ImgBurn”. 2. Choose “Run” in the pop-up window. 3. Choose “Next” at ImgBurn’s setup wizard 1st screen. 4. Accept the license agreement and choose “Next”. 5. Leave the default setup options and choose “Next”. 6. Leave the default install location (unless you are using another location to install programs) and choose “Next”. 7. Choose “Next” in start menu folder options. 8. When the installation is complete, choose “Finish” and start using ImgBurn. Step 2: Create ISO image archive from DVD, CD, etc. using ImgBurn. 1. Put the optical disk that you want to create image for, on the CD/DVD drive and double-click at ImgBurn application under Programs. 2. When ImgBurn application starts, click at the “Create Image file from disc” option. 3. Choose the Source CD/DVD drive (if you have more that one). 4. Select the name (optional) & the destination location for the ISO image archive. 5. Finally press the ‘Read & Burn” icon to create the ISO file from your optical disk. 6. Wait for the operation to be completed and you ‘re done! Navigate to the destination folder to find the recently created ISO image file from your optical disc. Open and explore the ISO image file contents like you ‘re doing with your optical CD/DVD drive. 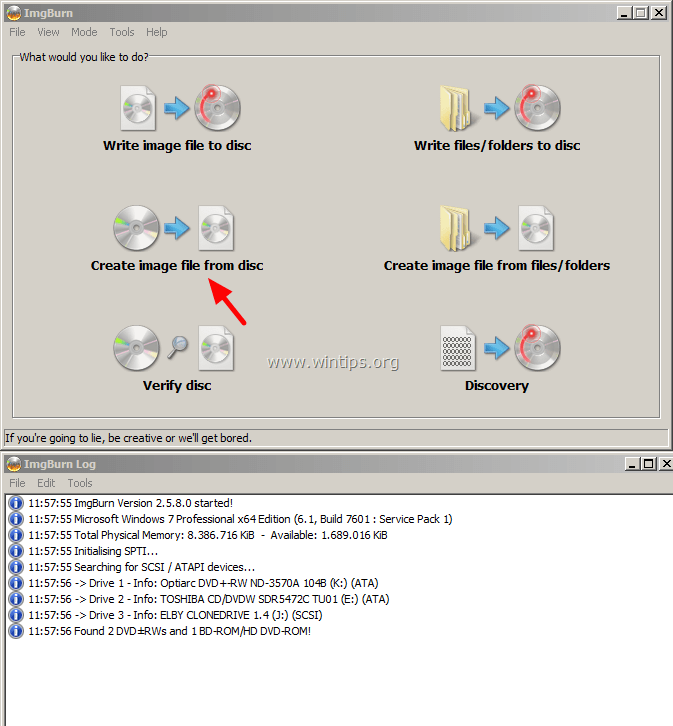 How to open ISO files in Windows 8, 7, Vista, XP, Server 2008, 2003. Burn the ISO image file to an optical disc. « Remove Gamezdoka.org Browser Hijacker (Removal Guide)	» How to create a Bootable Windows 8.x (8 or 8.1) USB Disk from ISO file.